Profiles in History Is Proud To Announce The Carrie Fisher and Debbie Reynolds Personal Property Auction Is Set For October In Los Angeles The estate of Carrie Fisher and Debbie Reynolds Will Soon Be Hitting The Market – Debbie Reynolds Dance Studio and Family Ranch Up for Auction in L.A.
Debbie Reynolds’ Screen Worn Dress from the “You Were Meant For Me” sequence in Singin’ in the Rain And Much Much More Los Angeles, Calif. – Profiles in History is proud to announce the Carrie Fisher and Debbie Reynolds personal property auction is set for October in Los Angeles. October 7th is the first day of what is expected to be a three-day auction. There will be well over 1500 lots in this auction, with items for collectors but also items for fans who want to own something special that belonged to Carrie or Debbie. The auction will take place in Profiles in History’s Calabasas location and online at www.profilesinhistory.com Pre-order a limited edition catalog now, as they are sure to sell out. 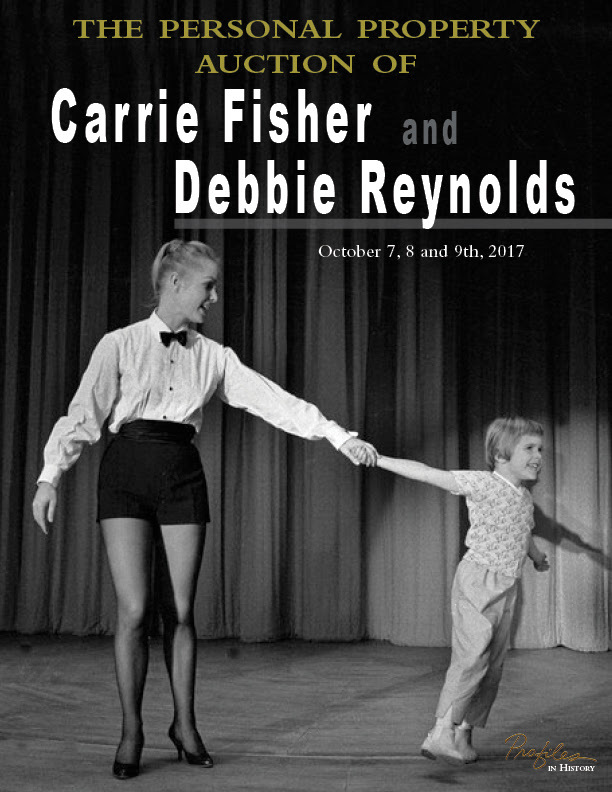 Debbie Reynolds Dance Studio and Family Ranch Up for Auction in L.A.
Los Angeles, Calif. – Profiles in History has announced the Debbie Reynolds Dance Studio and Debbie’s personal family ranch will both be going up for auction at the Carrie Fisher and Debbie Reynolds Personal Property Auction on October 7th, 8th and 9th in Los Angeles. Debbie established her legendary dance studio in 1979 to create a comfortable space for dancers to rehearse. It’s an 18,000 square foot building. The studio offers a friendly and relaxed atmosphere, while at the same time providing simple luxuries not found at other studios, including a lounge area, dressing rooms, showers and six spacious studios. Over the years celebrities like Lucille Ball, Michael Jackson, Madonna, Bette Midler, Cher, Usher, Mariah Carey, all have rehearsed their acts at the studio. The scholarship program offers a 10 month individually designed program so dancers could have a unique and personal experience. The Debbie Reynolds Dance Studio is estimated to sell for $6,000,000 – $8,000,000. for $4 to $6 million). Debbie’s Family Ranch is located in Creston, California. It sprawls over 44 usable acres with irrigated pastures. The ranch has a main residence with custom home theatre, library and gym. This unique property also includes a guest house, caretaker’s house, art studio, barn as well as a professional film and television production facility. The wildlife is abundant, there is a spring fed pond, spectacular sunsets and gorgeous panoramic views. The family spent a lot of time up there together. Founded in 1985 by Joseph Maddalena, Profiles in History is the world’s largest auctioneer & dealer of original Hollywood Memorabilia, historical autographs, letters, documents, vintage signed photographs and manuscripts. Born into a family of antiques dealers in Rhode Island, Joseph “Joe” Maddalena learned early on how to turn his passion of collecting historical autographs into a career. Upon graduation from Pepperdine, Joe pursued his passion to become a full-time dealer of historical documents, and opened his first office in 1985. Profiles in History has held some of the most prestigious and successful auctions of Hollywood memorabilia and own virtually every Guinness Book record for prices of original screen-used memorabilia. Highlights from their previous auctions include the “Cowardly Lion” costume from The Wizard of Oz for $805,000; Steve McQueen’s “Michael Delaney” racing suit from Le Mans for $960,000; From the history-making Debbie Reynolds Auction in June 2011, Profiles in History sold the Marilyn Monroe “Subway” Dress from The Seven Year Itch for $5.52M and the Audrey Hepburn Ascot Dress from My Fair Lady for $4.44M. In February 2012, Profiles in History arranged the sale of a pair of Judy Garland screen-used Ruby Slippers from The Wizard of Oz to the Academy of Motion Picture Arts & Sciences. In June 2017, at his Hollywood Auction 89, Joe sold the Gary Cannavo collection of Battlestar Galactica spaceships for 1.8 million dollars, the Saturday Night Fever dance floor for 1.2 million and an R2D2 for 2.76 million. In addition, Joe Maddalena was the star of Hollywood Treasure, which aired on Syfy. Hollywood Treasure took viewers into the fascinating world of showbiz and pop culture memorabilia. For more information visit www.profilesinhistory.com.